The second edition of a modern introduction to the chemistry and physics of solids. This textbook takes a unique integrated approach designed to appeal to both science and engineering students. 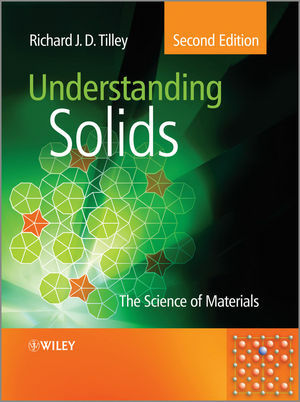 The book provides an introduction to the chemistry and physics of solids that acts as a foundation to courses in materials science, engineering, chemistry, and physics. It is equally accessible to both engineers and scientists, through its more scientific approach, whilst still covering the material essential to engineers. This edition contains new sections on the use of computing methods to solve materials problems and has been thoroughly updated to include the many developments and advances made in the past 10 years, e.g. batteries, solar cells, lighting technology, lasers, graphene and graphene electronics, carbon nanotubes, and the Fukashima nuclear disaster. The book is carefully structured into self-contained bite-sized chapters to enhance student understanding and questions have been designed to reinforce the concepts presented. The supplementary website includes Powerpoint slides and a host of additional problems and solutions. Richard J. D. Tilley D. Sc, Ph. D, is Emeritus Professor in the School of Engineering at the University of Cardiff, Wales, U.K. He has published extensively in the area of solid-state materials science, including four books for Wiley, 180 papers, and 15 fifteen book chapters.